APPSC Forest Range Officers Recruitment 2018, Apply Online: APPSC has released the Forest Range Officers Recruitment 2018 on December 12 and applications are invited from the eligible and interested candidates for fill up the Forest Range Officer vacan posts in the AP Forest Departemnt. 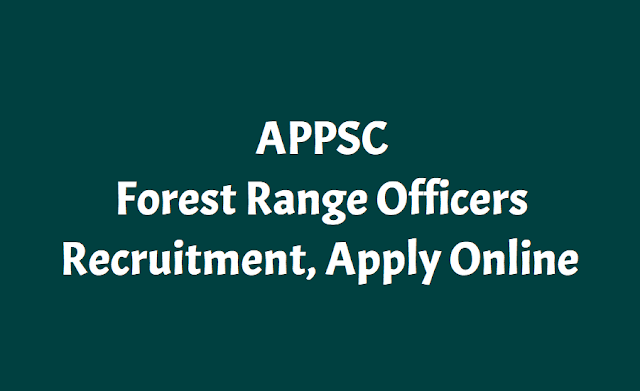 So, Applications are invited online for recruitment to the post of Forest Range Officers in A.P. Forest Service for a total of 24 vacancies in the scale of pay of Rs.31,460 - 84,970 from candidates within the age group of 18 to 28 years as on 01.07.2018. N.B: Common for Men and Women Must undergo a medical Examination to be conducted by the Medical Board at Visakhapatnam and produce a health certificate signed by the Medical Board in the form prescribed by Article 49 of the Civil Service Regulation testifying to the candidates sound hearing and general physical fitness for outdoor work in the Forest Department and to the fact that he bears on his body marks of successful vaccination. Candidates sould apply through online mode only. Before applying for the post, an applicant shall register his/her bio-data particulars through One Time Profile Registration (OTPR) on the Commission’s Website viz., https://psc.ap.gov.in. Once applicant registers his/her particulars, a user ID is generated and sent to his/her registered mobile number and email ID. Applicants need to apply for the post using the OTPR user ID through Commission’s website.